Although instinct says "hurry up and get in there," it is necessary for a decon operation to be set up and functional before anyone or anything enters the area. PERHAPS sparked by the devastating natural disasters and terrorist attacks the nation has experienced in the recent past, a renewed emphasis has been placed on ensuring that decontamination procedures are established and that they are a documented component of emergency response plans. While most of the focus is currently on communities and the health care service sector to have plans and supplies in place for mass victim decontamination, it is just as important for facilities to have proper decontamination (or "decon") procedures in place for emergencies that could occur at their facilities. Written decontamination procedures are required under the Occupational Safety and Health Administration's Hazardous Waste Operations and Emergency Response (HAZWOPER) regulations at 29 CFR 1910.120(b)(4)(ii)(G). These procedures must be communicated to everyone responding to an emergency and should always be practiced during response drills. Decon is a vital part of a hazardous materials emergency response. It is so important, in fact, that no one is permitted to enter a hazardous area until a decon operation is set up and functional [29 CFR 1910.120(k)(2)]. Unfortunately, this essential part of emergency planning is sometimes overlooked and misunderstood. Considering the following questions can help facilities ensure their decon plans will be adequate. Who is in charge of the decon line? 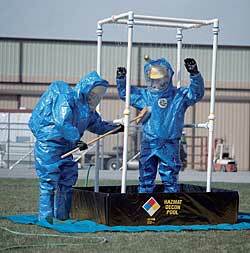 Decon line workers often report directly to and receive instruction from the Site Safety and Health Officer. It is important for this officer to monitor and check on people working in the decon line regularly to ensure no one has become fatigued, that the workers have ample supplies, and that their level of protection remains adequate. On a hot, humid day, this could mean checking as often as every 15 minutes. Decontamination work is very physically challenging; exhaustion, dehydration, or heat-related ailments are common for decon line workers. Where support staff could reasonably be expected to work a four- or eight-hour shift, one or two hours in decon may be a realistic limit for decon workers. Also, because these workers are commonly suited up in personal protective equipment that is one level below what the "active responders" are wearing in the hot zone (the area where hazards are present), gross contamination coming through the line could change the amount of protection decon line workers need to wear. Air monitors placed in the decon area are one way to help gauge exposure. Everyone involved with an emergency response should have a working knowledge of decon procedures. Specifics on the decon process should be part of a responder's briefing prior to entering the hot zone. Practicing different forms of decon during drills will help everyone become more comfortable with various forms of decontamination so that during an actual emergency, this process runs smoothly. Outside resources, such as contractors, suppliers, hospitals, firefighters, police, and emergency medical services who are listed on the response plan and who may be called upon for assistance during an emergency also need to be trained and made aware of decon procedures so they are aware of their need to follow these procedures while they are on site. First Responder Operations Level training teaches workers how to implement basic decon procedures [29 CFR 1910.120(q)(6)(ii)]. This level of training also includes knowledge of basic hazards and risk assessment techniques, selection and use of PPE, an understanding of hazardous material terms, knowledge of operating procedures, and basic spill containment/confinement techniques. What equipment is needed for decon? For wet decontamination--commonly used to decontaminate responders, tools, and large equipment--water, hoses, brushes, buckets, cleaning agents, tarps, pools, pumps, and tanks to hold the contaminated water are common. Stools or chairs that can be easily cleaned are also helpful for responders who need to take off PPE. Disposal bags are also helpful for bagging items that will not be reused, such as inner gloves, disposable under-suits, tape, etc. Dry decontamination--which usually translates to bagging everything that comes out of the hot zone--could require brushes to remove gross contamination and bags to collect all spent materials. As in wet decon, stools or chairs are nice accessories for responders removing PPE. If there is potential for mass casualties, consider items described for wet decon as well as privacy tents or enclosures, stretchers that can be easily decontaminated, rolling tables or carts with wheels, and modesty garments. What do I do with all of the waste from the decon line? Large volumes of wastewater from decon can present a big problem. Prior to an emergency, determine how this water can and will be treated. In some cases, the local wastewater treatment authority may be able to assist or provide the names of other local companies that can provide treatment services. Listing options and contacts in emergency plans will help when this information is needed during an emergency. Other wastes, such as bags of used PPE, can often be incinerated or containerized for disposal with other wastes that are generated. When does a decon line need to be established? In any emergency, the first few minutes are the most critical. Although instinct says "hurry up and get in there," it is necessary for a decon operation to be set up and functional before anyone or anything enters the area [29 CFR 1910.120(k)(2)]. Considering the scope of the emergency and determining proper decontamination procedures for different scenarios can help this process run more efficiently. Different forms of decontamination can be worked into response plans for different scenarios. A 55-gallon drum of lubricating oil that is punctured by a forklift could constitute an emergency based on the fact that there are floor drains in the area that lead directly to a pristine fishing hole. Decon for a situation like this is going to be much different than decon for an entire shift of workers who have been sprayed with 500 gallons of methyl ethyl ketone from a ruptured overhead pipeline. In the first case, setting up multiple lines staffed with six people each would probably be overkill. But it might be right on target for the second case. Where should decon be located? Decontamination operations should be set up in the "warm zone," which is sometimes also referred to as the "contamination reduction corridor." It should be far enough away from the hazard or emergency that decon workers are not in immediate danger. If the decon line is established outdoors, it should be in an area that is upwind of the hazard, because moving the decon line causes delays and confusion. In some cases, especially if many victims are involved, it can be beneficial to locate a decon line in an area that is easily accessible to ambulances or other emergency transport vehicles. Determining the number of decon lines necessary is also a factor to consider. For a small incident, one line may be sufficient. If victims are being taken from the area by one group of responders while another group of responders stops or cleans up a spill, it might be advantageous to have multiple lines: one for victims, a second for responders and equipment. Having regular drills can help determine what works best for a given situation. If 20 "exposed" people are lined up in single file during a drill waiting for decon before they can be transported to the hospital and responders in level A suits are running out of air while waiting to be hosed down, consider drilling with two or three lines the next time. OSHA defines decontamination as "the removal of hazardous substances from employees and their equipment to the extent necessary to preclude the occurrence of foreseeable adverse health effects." [29 CFR 1910.120(a)(3)]. While it is not exactly easy to get lugged forklift wheels clean while wearing bulky PPE, allowing the forklift to leave a hazardous area without being properly cleaned creates hazards outside the hot zone and increases the amount of area that needs to be cleaned before a project can be considered complete. Likewise, improper cleaning of monitoring equipment, tools, or PPE can lead to future problems when the items fail service inspections or are not suitable for reuse when they are needed again. In essence, everyone and everything that comes out of the hot zone needs to be decontaminated, including victims. Even though life safety is of the utmost importance during an emergency response and time is often precious, a victim can pass contamination on to emergency medical personnel, ambulances or response vehicles, and hospital emergency rooms--potentially putting these resources out of service until they can be properly decontaminated. In a large-scale emergency, this can be very problematic. Too often, some responders view decon as a "necessary evil" instead of the valuable tool that it is. Without proper plans and established procedures in place, contamination from a site or incident can cause a host of problems elsewhere in a community. Reviewing plans, training regularly, and modifying plans if necessary can help ensure everyone's safety during and after an emergency.